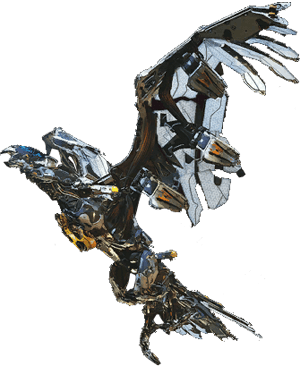 Strombird is an Enemy machine in Horizon Zero Dawn. "Highly maneuverable flying machine with a wide array of Shock-based air-to-ground attacks." Tie it down with the rope caster to get clear shots/hits, you can also blow the canisters with elimental arrows (frost on sholders fire on back/tail area). rinse reapeat until ded-i-fied! Blaze Canister: Blaze Storage canister. Shooting elemental canisters with elemental ammo triggers an explosion that will damage everything nearby. Shoot off this component to collect the resource inside. Engine: Destroying this component disables the dive melee attack. Freeze Canister: Chillwater can be looted from this canister. Shooting this canister with a Freeze arrow will trigger an explosion Freezing anything in the area. Lightning Gun: Destroying this component disables the ranged Shock attacks.